Since I started cooking, oyster sauce has become so handy for me. It is one condiment that I find so ideal in creating flavorful dishes. I just love how well it works with anything! Whether it be beef, pork, poultry, seafood or vegetables, the savory flavor of oyster sauce will definitely create an amazing dish out of it. 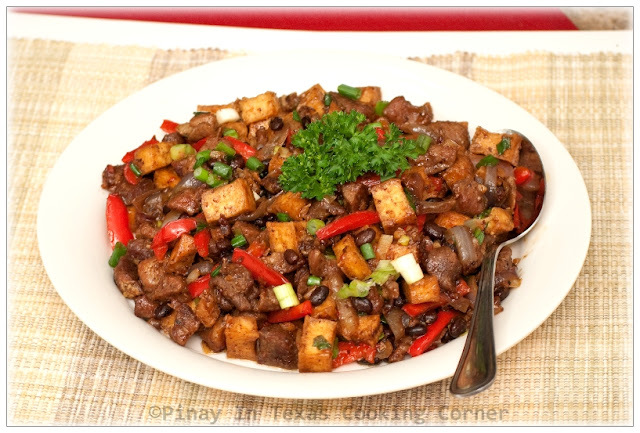 This Pork With Tofu and Black Beans in Oyster Sauce is another one of those many dishes that I came up with using oyster sauce. 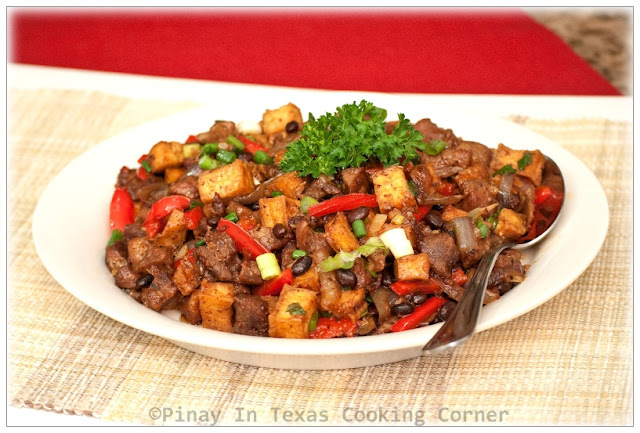 It's a combination of lean pork cubes, fried tofu and freshly cooked black beans and bell pepper for added flavor. For the steps in cooking beans, go here. Before going to the recipe, I would like to take this chance to thank my new blog friend, Balvinder of Gluten Free Food for giving me The Liebster Blog Award. Liebster is a German word meaning "dearest" or "beloved". I am truly thankful to Balvinder for considering my blog dear to her. :) If you haven't been to her blog yet, do check it out and be amazed with Balvinder's tested gluten free recipes! 1. 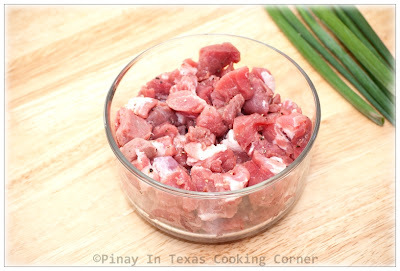 Sprinkle pork with garlic powder, salt and pepper. Let sit for at least 15 minutes. 2. 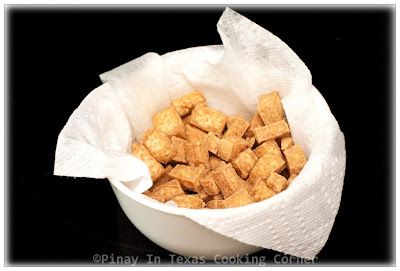 Under medium-high heat, fry tofu in vegetable oil until golden brown. Drain and set aside. 3. In a wok or large saucepan over medium heat, cook pork in ½ cup water until water has evaporated. Push to one side of the pan. Pour olive oil into the wok, and saute garlic until light brown. Add onions and mix with pork and garlic. Saute until onion is translucent. 4. Add oyster sauce. Mix until well combined. Reduce heat to low. Cover pan and simmer until pork is tender. 5. 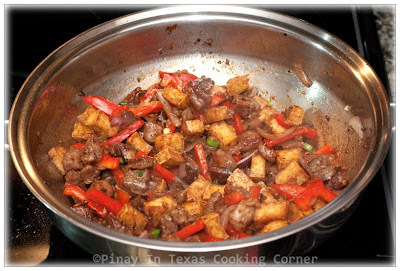 Add tofu, bell pepper and half of the green onions. Mix well with other ingredients. Season with salt and pepper to suit your taste. Simmer for another 3 minutes. 6. Remove from heat. Transfer to a serving platter and top with remaining green onions. Serve with hot rice. You're welcome! Glad to share it with you! Tnx Ridwan! 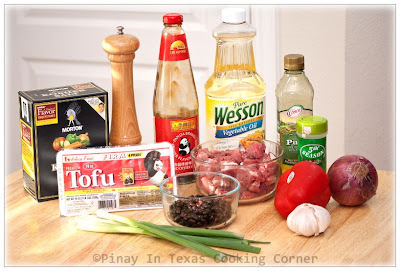 Yes, oyster sauce works so well on beef too! I wish we where neighbors because i would be over in a heart beat for dinner! This looks tasty as always! I would definitely be glad to have you over! Nothing beats a homely dish like this for a nice family dinner. Yum! I am really getting hooked on your one dish meals, this one looks like another winner! Great ingredients and flavors. It is time to tell your family how lucky they are to have such a great cook in the house. Well done! That looks scrumptious ! Love the flavor and texture in that yummy dish ;) And CONGRATS on that well-deserved award !!!! I think I should learn from you using oyster sauce! I think I just have fish sauce at home.. Thanks Tina for this wonderful wonderful Award!! Thanks for sahring! And the other blogs you choose are too alot deserving :)!! oyster sauce is the best! I love it on everything- especially with this pork dish! YUM! Congrats and thank u for this award! Very colorful and Delicious meal Tina! I love your photos as always!Congrats on the award! Oh that looks so tasty! 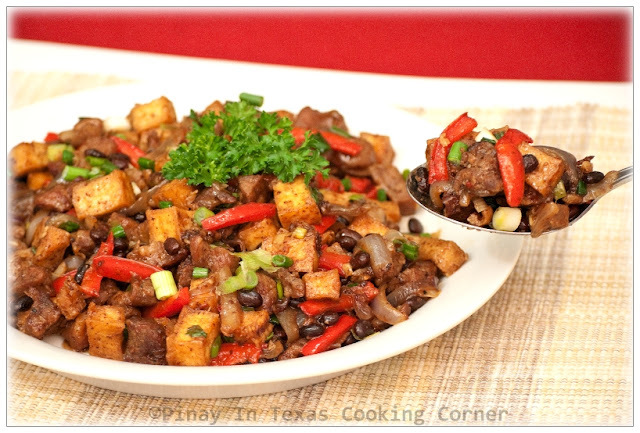 I love that you mixed pork, tofu and black beans, way to really up the protein and fillingness of the dish. Congrats on the award! I just had pork and eggplant with oyster sauce. You know it's one of my favorite flavor. I always end up eating too much rice. Yours with tofu looks delicious. I should try that one next time! What a simple and tasty recipe! I love tofu and use it in a lot of my dishes. Congrats on your award! You totally deserve it. Thank you for the Liebster Award, Tina! You are your blog are becoming dear to me as well. My blog wants to be like yours when it grows up! :) Keep the fresh ideas and great photos coming! This looks like a kicking little stir fry of sorts! Love the flavor combos.